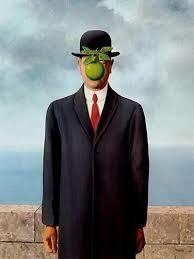 René Magritte was a Belgian artist – he was born at the end of the 19th century and died in 1967. His mother died by her own hand when he was just 13. His art is described as surrealist. 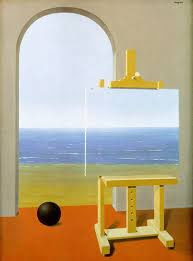 To me this means that his paintings are sort of dreamy and unreal but real at the same time. The painting at the top of this post is called The Son of Man – it is supposed to be a self portrait. I think that the apple is a biblical reference but haven't found any authority that suggests this. You can just see part of his eyes peeking over the apple. This work was done in 1946 – just after the war. The Human Condition II (1935) features a painting within a painting – but the image and the painting merge pretty much seamlessly. I have no idea what the dark ball is about. I'll finish off with this weird one called The Therapist - it looks like a man at the seaside hiding from the sun with a birdcage on his knee. But to me his entire middle is replaced by the cage. There are 2 birds – one in the cage and one outside it. Any ideas? 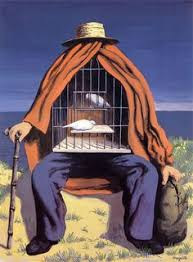 I love René Magritte and have been lucky enough to have seen several exhibitions with his work. I wouldn't know why he chose an apple so often for his paintings but I recently heard that the Apple logo from the Beatles record company was directly inspired by his paintings. I thought that was pretty cool!